If you’re not familiar with Bloomberg’s Echoes column, you should put it on your reading list. Echoes features columns on the intersection of politics and history. Most are fascinating. The current one, or should I say the one I’ve chosen to focus on, describes the 1884 presidential campaign of Republican candidate James G. Blaine vs. Democrat Grover Cleveland. The cartoon that changed the 1884 election. Source: Walt McDougall, New York World, Oct. 30, 1884. Running neck-and-neck with Democrat Grover Cleveland, Blaine had to win the state. To help fill his campaign coffers, Blaine agreed to attend a sumptuous fundraising dinner, organized by 200 prominent Republican supporters, on Oct. 29. The venue was the ballroom at Delmonico’s, a swank restaurant in the financial district. Among the guests were several of the richest, best-known and most politically connected businessmen in the country, including the Navy contractor John Roach and the financier Jay Gould. Blaine’s day began badly when he took part in an impassioned rally hosted by several hundred Protestant clergymen — all Republicans — at which a Presbyterian minister denounced the Democrats as the party of “Rum, Romanism and Rebellion.” The slur soon went viral, outraging Irish Catholic voters who might otherwise have sat out the election. The worst was yet to come. The Delmonico’s dinner played into the hands of journalists primed by a long and bruising campaign to accentuate Blaine’s financial ties with Wall Street. Most devastating of all, it furnished New York World illustrator Walt McDougall with the theme for a blistering cartoon that would run the next day on the front page of one of the city’s biggest newspapers. 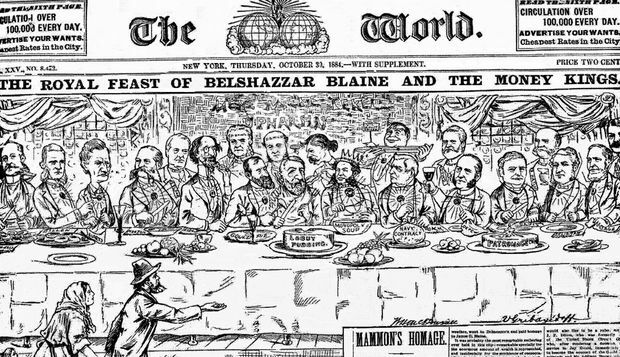 McDougall’s cartoon — titled “Royal Feast of Belshazzar Blaine and the Money Kings” — portrayed Blaine as a supplicant at the beck and call of plutocrats who dined on “monopoly soup,” “patronage” and “lobby pudding” while a humble laborer and his family looked on, begging for crumbs. “Mammon’s Homage” screamed the headline that accompanied the cartoon: “Millionaires and Monopolists Seal Their Alliance.” McDougall’s work was an instant sensation. Democratic activists enlarged it into posters that they plastered on walls all over the city and on placards that the party faithful held aloft at rallies. The cartoon had clearly hit a nerve. Blaine’s refusal to make a full disclosure of past financial dealings troubled many voters, including some influential Republicans, while party insiders, including many businessmen, feared his full-throated endorsement of government policies they assumed would hasten economic consolidation. Opposition to monopoly was a potent rallying cry in 1884, and the New York World had been editorializing for weeks that a Blaine presidency would widen the gap between rich and poor. History, which, by the way, is a part of a now much maligned liberal arts education, does hold lessons for us. Lessons which the GOP and its party leader Mitt Romney seem to have forgotten. Currently, Mr. Romney appears to be following the lead of Blaine: denigrating nearly half the nation’s population, aligning himself with Wall St interests, and spending a large share of his time fundraising among the nation’s most wealthy. If Romney loses this election, which new polls suggest is likely, it will be because he failed to understand the American populace. By aligning himself with the wealthiest in the nation, he effectively has disconnected himself from average middle and working class Americans. These average Americans, from left, right and center, are outraged by the Wall St bailouts; the corruption that led to those bailouts and the continued revelations of Wall St corruption; by CEOs who are given outrageous salaries and benefits regardless of poor company profits and performance; and by corporate interests being put ahead of the American people in so many ways. Yet, the Romney-Ryan ticket not only does not “get it,” they apparently do not care. Given everything Romney and Ryan have said and written over the last couple of years, these two men do not understand average working Americans…nor do they much care about them. Their alliance is with this economy’s economic and financial winners, not with the rest of the nation’s population. Some accuse me of hating business or being in the tank for Democrats. Nothing could be further from the truth. I worked in the private sector for over 30 years and often doubled my employers’ profits. My interests now, and always have been, are to make the United States stronger; to even the playing field for all businesses; create a taxation system of which Adam Smith would approve; and streamline the federal government to meet the needs and challenges of a globalized, highly competitive 21st Century without dumping the regulations required to protect the American people from “bad actors”; and to create a economic system and economy capable of meeting the many challenges of the 21st century. Romney has now publicly aligned himself, through his own “inelegant” but truth-telling statements, with the ethos of that earlier losing candidate, Blaine, back in 1884.Think about it: are the nation’s people all that much different from people back in 1884? The GOP needs to think about it. « Survey Says… 2/3 of Americans Say Candidates Should Address Corporate Wrongdoing.